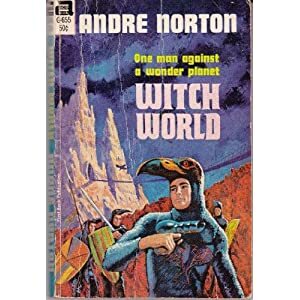 Andre Norton, the woman who has not one, but two literary genre awards named after her. She broke glass ceilings left and right, has a near endless list of books to her name, and is rightfully so a legend in the science fiction community. Her Witch World series started with a few stories, and grew exponentially to cover over 20 novels and novellas known as the Estcarp Cycle and the High Hallack Cycle. What I’m getting at here is that if you style yourself a science fiction fan, read yourself some Norton. She may not use the flashiest guns or the shiniest spaceships, but these are the stories your favorite authors grew up reading. These are the stories that influenced many of the authors who are influencing you. If there is such a thing as traditional sci-fantasy, Witch World is it. Simon Tregarth, soldier turned bootlegger is running from the law. Approached by a gentleman who promises he can hide Simon forever, Simon doesn’t have much of a choice. Offered a doorway to the “world his heart desires”, Simon finds himself someplace. . . strange. After saving a woman who is being hunted, Simon slowly learns about this new world. Escarp is a country ruled by women who have the Power (witches), and the surrounding countries are primarily male dominated cultures who wish to take over Estcarp. Estcarp’s highly trained guardsmen (assisted by Simon) can take care of most of her enemies. But the soldiers of the Kolder, that’s a different story all together. Once they are on the march, no amount of guns or arrows will stop the creatures of Kolder.